Samsung WF45H6300A washing machine. When start button is pushed there is a buzz (I assume the normal pump sound) then the door locks, then, after a few seconds, the door unlocks and the cycle fails to progress. Sometimes pressing pause results in error code that is either BE or 8E, I can't tell which it is supposed to be. Checked hot & cold water hose flow, checked water intake filters, and cleaned a dirty pump filter. Still won't work. I am not sure how to tell this but i push the power button and then it starts to spin a tad. I usually notice that it will spin the middle but it does not do that and goes to PE error. I went into test mode and try to run a cyle and PE error right away. the service manual says it is a clutch error. 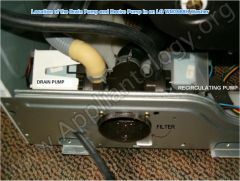 I did not know if i just order this http://www.appliancepartspros.com/samsung-assy-dd-bldc-dc93-00309a-ap5621714.html or if i need to order http://www.repairclinic.com/PartDetail/Rotor-Position-Sensor/DC3100098A/2068316?TLSID=1873 I would love to know what to check before ordering. I have an multimeter and not afraid to read voltages. Washing machine will not start a load. It has power, all the buttons come on. It is not overfilled nor is the door not locked. After you pick the cycle and press the start button is just sits there. However, if you let the machine sit, it magically will run again. Sometimes it needs to sit 30 minutes. The last time it did not work for a week and then started working again. When it starts working, sometime I get only one load out of it before it stops again. One day last week it ran for four loads before it stopped working for three days. This is very frustrating. 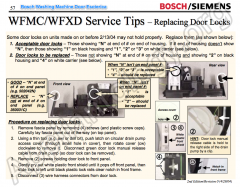 Hello, I am looking for a service manual for a Bosch WFR2460 Axxis+ washing machine, thank you. Buy the replacement door lock assembly here.